…ethics is defined as “the bold endeavor to speak about the way in which the form of Jesus Christ takes form in our world’ (Ethics: 88) (John de Gruchy, ed., Dietrich Bonhoeffer: Witness to Jesus Christ, 31). I played softball earlier this evening. According to Dietrich Bonhoeffer, I was to represent Jesus on the field and in the dugout! …was able to travel without much difficulty to Switzerland, where he met Barth, and Sweden, where he met Bishop Bell, his chief ecumenical contact in London. His real purpose was to help Jews escape from Germany, and get the support of the Allies for the German resistance. He largely succeeded in the first, but failed in the second (John de Gruchy, ed., Dietrich Bonhoeffer: Witness to Jesus Christ, 30). …Bonhoeffer was the employ of the German military intelligence (Abwehr), ironically the centre of German resistance to Hitler. 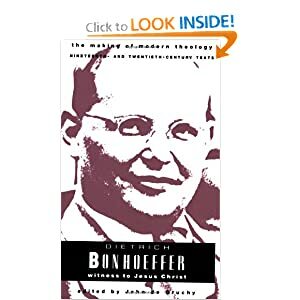 Bonhoeffer was ostensibly employed by the Abwehr because, it was argued to the suspicious Gestapo, his ecumenical contacts could help in gathering information useful to the war effort (John de Gruchy, ed., Dietrich Bonhoeffer: Witness to Jesus Christ, 30). At twilight, as 100,000 spectators looked on, 110,000 Nazi soldiers bearing 30,000 banners and standards marched onto the field. Then the Führer entered through a spotlighted gate. Instantly a line of 150 powerful, anti-aircraft searchlights, 40 feet apart, cast their beams 25,000 feet straight up into the night air. The effect was stunning. The British ambassador called it “solemn and beautiful . . . like being inside a cathedral of ice.”1 “Church” was now in session. William Shirer, author of The Rise and Fall of the Third Reich, observed that one meeting at Nuremberg “had something of the mysticism and religious fervour of an Easter or Christmas Mass in a great Gothic cathedral.”12 It seems that men must worship something, and demagogues will answer this need with dreadful counterfeits when the Church falters. 1 Frederic Spotts, Hitler and the Power of Aesthetics (New York: The Overlook Press, 2003), 66. On April 6, 1943, Bonhoeffer and Dohnanyi were arrested not because of their conspiracy but because of long-standing rivalry between SS and Abwehr for intelligence fiefdom. One of the informers of Abwehr, Wilhelm Schmidhuber, was arrested by the Gestapo for involvement in a private currency affair. In the subsequent investigations the Gestapo uncovered Dohnanyi’s operation in which 14 Jews were sent to Switzerland ostensibly as Abwehr agents and large sums in foreign currency were paid to them as compensation for confiscated properties. The Gestapo, which had been looking for any dirt to discredit Abwehr, sensed that they had a corruption case against Dohnanyi and searched his office at Abwehr, where they discovered notes revealing Bonhoeffer’s foreign contacts and other documents related to the anti-Hitler conspiracy. One of them was a note that discussed plans for a journey by Bonhoeffer to Rome, where he would explain to church leaders why the assassination attempts on Hitler in March 1943 had failed. Nevertheless, Bonhoeffer’s involvement in assassination plots was not known by the Gestapo as Abwehr succeeded in explaining away the most damning documents as official coded Military Intelligence materials. Dohnanyi and Bonhoeffer were, however, suspected of subverting Nazi policy toward Jews and misusing Abwehr for inappropriate purposes. Bonhoeffer was, for instance, suspected of evading military call-up, using Abwehr to circumvent Gestapo injunction against public speaking and staying in Berlin, using Abwehr to further Confessing Church works, etc. Writing to Eberhard Bethge from Tegel prison in November 1943, Bonhoeffer reproached himself for not having finished his Ethics…it became a passion intensified and directed by the events of the time and the context within which he found himself as a member of the resistance. Isolated from the church, he found a new community of reference, and discourse amongst his secular co-conspirators. He was busy writing a draft chapter of his proposed Ethics when, on 5 April 1943, he was arrested at his parents’ home (John de Gruchy, ed., Dietrich Bonhoeffer: Witness to Jesus Christ, 30). Hear the word of the LORD, you Israelites, because the LORD has a charge to bring against you who live in the land: There is no faithfulness, no love, no acknowledgment of God in the land. There is only cursing, lying and murder, stealing and adultery; they break all bounds, and bloodshed follows bloodshed. No faithfulness, no love, no acknowledgement of God in the land. At first I thought it was Dietrich Bonhoeffer who said, “The only thing necessary for the triumph of evil is for good men to do nothing” but when I looked it up I found that it was actually Edmond Burke. He was born first so he had the advantage. If nobody else had said it by the time D. B. was around he would have. It fits with the sentiment in much of his writings as well as the way he lived his life. Bonhoeffer’s most famous book is The Cost of Discipleship and to better understand how this concept fits with what he was writing there and to a lesser degree his other works, we really need to grasp what happened to the church and the society in Germany at that time. The charge Hosea brings against Israel could just as easily have been laid against the German Lutheran and Catholic churches. There was no faithfulness. The German church had its loyalty to God usurped by its loyalty to Garman society, the German nation, and bit by bit, to the NAZI party. There was no love. One by one subcultures in Germany were marginalized, suppressed, and eventually eliminated. Again, I believe it was D. B. who said something like: “First they came for the Communists, but I was not a Communist so I did not speak out. Then they came for the trade unionists and the social progressives, but I was neither so I did not speak out. Then they came for the Jews but I was not a Jew so I did not speak out. And when they came for me there was no one left to speak.” It is love that compels us to speak, it is selfish interest that shuts us up. Finally, there is no acknowledgement of God in the land. Very quickly in Germany the mantra became not “In God we trust” but rather “Heil Hitler”. As a result there was cursing. This is literally to call down destruction on someone. It’s the type of cursing a witch would do but without all the boiling pot and spooky words. In Germany they simply called it informing. If you didn’t like someone it was very easy to make their life very difficult no matter how innocent they were. There was murder stealing and adultery. Millions were rounded up and sent to concentration camps. Their property was taken, their women brutally used, and their very lives were fuel for the fire. This bloodshed was, of course, counterpoint to the bloodshed we now call World War II. In a 1930’s Germany that was producing so many great theological minds like Karl Barth, Emil Brunner, the Neibhur brothers, and of course Dietrich Bonhoeffer among others, it saddens me that such a charge can be laid them. It sickens me that the same charge can be laid against the Evangelical church in America today. But you might be saying, “Wait a minute, we aren’t murdering millions of innocent Jews in concentration camps.” No, we are murdering millions of voiceless children in so called hospitals and health centers. Is there faithfulness? A hotel employee has said on record that they love it when religious conventions come to town because it always gives a boost to the pornographic pay per view programming. The former leader of the Evangelical Association was not an anomaly but rather than a symptom as we see more and more leaders being exposed for saying one thing while living another. I was one of them. Is there love? Why did we not hold our president accountable when he actually cut spending for faith based initiatives from what it was under Clinton after it was such a major part of his first platform. Why are we throwing troops with guns against an oppressed people rather than workers with food and medicine? Is there an acknowledgement of God in the land? 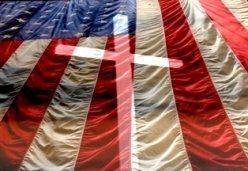 Just recently a person asked me when they found out I am a registered democrat, “How can you do that if you are a Christian?” If our “Christianity” has become so allied with a political party then who is it we are really acknowledging. That is why many leaders like Tony Campolo and Jim Wallis as well as ordinary guys like me are no longer calling themselves Evangelical but rather Red Letter Christians. It’s time to break free from the lies that society and the church have swallowed and get back to what Christ has called us to be doing. Traveling evangelists are quietly disappearing. I’ve listed some reasons for the decline, but I believe there may still be a future for vocational evangelism. Clayton King is the type of evangelist I hope we see more of in the coming years. His evangelistic ministry is church-based and Christ-centered. Though he is young, he is already mentoring those coming up behind him. What I like most about Clayton is that his style of evangelism does not negate (in fact, it highlights) the paradoxical nature of Christian discipleship. The call to discipleship is not just a call to making heavenly accommodations upon your death. It’s the call to pick up one’s cross. 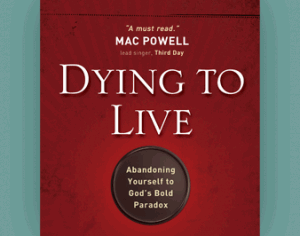 Clayton’s book, Dying to Live: Abandoning Yourself to God’s Bold Paradox (Harvest House, 2010), emphasizes the cost of dying to oneself in order to live to Christ. As I read the book, I couldn’t help but hear echoes of German theologian Dietrich Bonhoeffer. How might Bonhoeffer engage in evangelism in our context today? I’m certain he would focus our attention on the cross and expect the cross-centered life to color everything we think about discipleship. And it’s that same paradoxical picture (dying to live) that forms the heart of Clayton’s vision. So the title has a double meaning. At one level, Clayton intends to pique the interest of people who are dying to live, people who want to experience life in its fullness and not settle for a mere existence with little purpose or direction. Only Christ offers the meaning and fulfillment our hearts hunger for. But at another, more profound level, the title takes us into the nature of regeneration. Those who are dying to live in the first sense must realize that they must die to themselves, their sins, and their idolatry in order that they may be raised to a new way of life. By dying, we live. By losing our life, we find it. By taking up the cross, we receive the crown. Ironically, we find purpose by abandoning ourselves to God’s purpose. Clayton makes the case for this paradox by telling personal stories, reminding us of famous movie scenes, and introducing us to biblical characters. Along the way, he rehabilitates the legacy of Jesus’ disciple, Thomas. Though we think of Thomas as “the doubter,” Clayton reminds us that Thomas was willing to go with Jesus to Jerusalem. “Let’s go die with him!” Thomas once said (John 11:16). Sure, he had his doubts, but Thomas is also a powerful example of following Christ – what it means to abandon one’s personal plans and look to the cross. As the book progresses, Clayton focuses on what it meant (and means) to declare that Jesus is Lord. Quoting Bonhoeffer, he explains the difference between costly grace and cheap grace. It is only through embracing the costly grace offered to us through the death of Christ that we are able to trust God in the dark times and see our suffering in light of God’s purpose. Dying to Live accomplishes two things at once. It’s a wake-up call to Christians who may have forgotten the counterintuitive, paradoxical nature of the Christian life. It’s also an evangelistic plea to non-Christians, showing them a great salvation bought by the costly blood of Christ. Clayton does not minimize the costs of discipleship. He emphasizes them. (And that makes him a fellow proponent of the “subversive evangelism” I write about in the last chapter of Holy Subversion.) Pick up Dying to Live and you’ll be challenged by this readable book that shines light on the paradoxical nature of salvation. Below is a quote from Dietrich Bonhoeffer on American Christianity. Please, read it and think through it. Although he was speaking of the American church in the 1920′s and 30′s think of how his words might apply today.